All too often some drivers see red lights and stop signs as optional. They’re in a hurry and feel a need to get where they want to go as quickly as possible. A driver may be too distracted by a smartphone or drinking coffee to notice the stop sign. Someone impaired or intoxicated by drugs or alcohol may not realize the need to stop or are too impaired to judge the risk. About 40% of all auto accidents that occurred in 2008 happened at intersections, according to the National Traffic Highway Safety Administration (NHTSA). Their study states that an estimated 2,307,000 crashes occurred at intersections across the country. In addition, there were 7,421 fatal crashes and in 733,000 crashes, one or more vehicle occupants suffered injuries. As the statistics show, the results of an accident at an intersection literally can be deadly. They often result in a “T-bone,” sideswipe, or broadside collision where the front of one vehicle hits the side of another. This is especially dangerous for a car because while the front and the rear have substantial “crumple zones” to absorb a collision, the sides of cars do not. For those involved in a broadside collision, the result too often is an innocent driver and any passengers having severe and often very painful injuries, which can be difficult, time-consuming, and expensive to fully treat. These injuries often require ongoing treatment and rehabilitation. 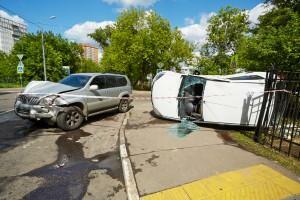 What should I do after being injured at an intersection accident? If you or a loved one was injured in a car collision at an intersection because of a negligent driver, contact the expert Georgia car crash injury attorneys at Van Sant Law so we can talk about the situation and learn your options for your damages and injuries. Trying to resolve this with an insurance company on your own or waiting too long to file a legal claim can severely hamper or prevent full recovery for your injuries.